Rebecca Wilson, DCR's Longleaf Pine Restoration Specialist, stands next to an 8-year-old native longleaf pine at Chub Sandhill Natural Area Preserve. As a Burn Boss, Wilson organizes and oversees prescribed burns, part of the restoration effort to bring back the species. Once prolific in Virginia, the longleaf pine was decimated by European settlers in the 17th and 18th Centuries. Less than 200 mature, native trees remain. But efforts to bring back the species are seeing progress. Catherine Komp has more for Virginia Currents. Learn More: Read the 2014 Status Report on restoring the Longleaf Pine and see maps, photos and other research conducted by DCR's Rick Myers. Scroll down to see video produced by Community Idea Stations Angela Massino and Taylor Gleason. The longleaf pine is a tree with personality. Rebecca Wilson: They look a lot like a Dr. Seuss character, they look like something the Lorax would be protecting. 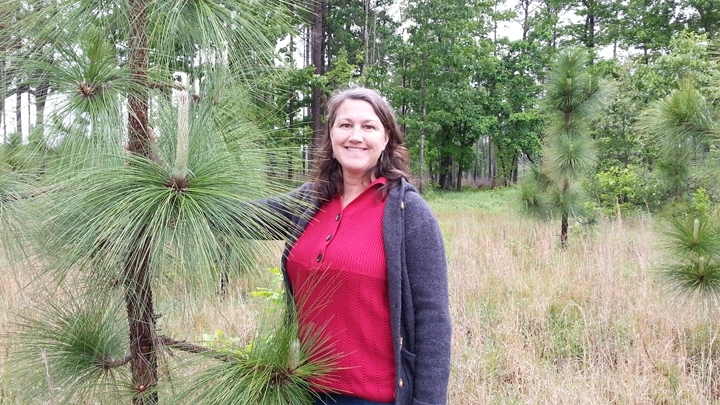 Rebecca Wilson is Virginia’s Longleaf Pine Restoration Specialist. We’re standing in a large field of longleafs planted eight years ago at Chub Sandhill Natural Area Preserve. It’s a captivating sight partially because it’s so unfamiliar. Rick Myers: It’s a tree that hasn’t been seen in Virginia for centuries. Rick Myers is the Natural Heritage Stewardship Manager for Virginia's Department of Conservation and Recreation. Myers: There's literature that describes longleaf pine as having been extirpated, extinct from Virginia around the mid-1800s. So no one alive has ever seen this before, this is new to Virginia. Longleaf pine can grow more than 100 feet tall and live for 300 years. In Virginia, it’s sometimes called “the tree that built Tidewater.” John Smith and other colonists created a “naval stores” industry out of longleaf pine, harvesting the trees’ sap to make pitch, used to seal boats, and tar, for greasing axles. In 1791, according to Myers’ research, nearly 30,000 tons of naval stores were exported from Norfolk. Land clearing and feral hogs that devoured the seedlings also contributed to the disappearance of more than a million acres of longleaf pine in Virginia. Historically, longleaf pine thrived across some 90 million acres from Virginia to Texas. It was so abundant due to fires that were common for millennia, many occurring naturally, some used by American Indians to manage their lands. And fire is how an inter-agency effort is bringing native longleaf back to Virginia. Myers: Even before this year’s fire, this would have been green and the fire that burned through killed these needles but it didn’t kill the terminal bud in this grass stage longleaf pine seedling. Myers crouches down over a longleaf seedling planted a few seasons ago. While the needles are scorched brown, the terminal bud is bright green. Myers: And now this seedling is positioned to grow really fast this summer. Wilson: I am actually a federally recognized Burn Boss through the national Wildfire Coordinating Group has a lot of different qualifications all marked out for different jobs and Burn Boss is one of them. RXB2, so Prescribed Fire Burn Boss, level two. Each restoration site needs to be burned every couple years. Burns require a lot of planning and precision, and it’s not a fun job, says Wilson. Days are long and smoky. But mother nature responds. Myer: You found it, the rarest plant in Virginia. Just months after a burn here at Chub Sandhill, the ground is covered in native plants. Several types of legumes, an important nitrogen fixer, cover the forest floor. One of them is extremely rare. Darren Loomis: It’s not flowering yet, but this is the hoary scurf-pea, also sometimes called Indian bread root. As DCR’s Southeast Region Steward, Darren Loomis’s job is to track and inventory these rare plants. Loomis: We currently know about three or four plants here on this site and this is the only site that it occurs in Virginia so there may be only three or four plants of this in the entire state. This is a plant that's not common wherever it's found, so even though it's more common further south, even in the correct habitats you don't run into it frequently. This will probably never be a really common plant out here but as long as we keep the habitat for it in good condition, it should persist. We also see patches of Golden Puccoon and lots of Virginia’s native cactus. There are plenty of birds: indigo bunting, summer tanager, yellow-breasted chat, rufous-sided towhee and a species that’s been sharply declining, the bobwhite quail. Wilson: We're managing for longleaf pine ecosystems and rare plants that are within that system but as a side result we have a lot of quail out here. We’re not managing for quail necessarily, we’re managing for rare plants. I think of it as managing for the most sensitive species in the system, if you do right by that most sensitive thing, then you're doing right by everything else in that system too. Myers: Most of the life here is really well-suited to fire and responds in a positive way to fires, frequent ones. We get the native beans, we get rare plants, we get longleaf pine and species like quail that are adapted to this system too. Fire opens up the canopy to let more sunlight in. Fire also can spark chemical triggers for plants that have been dormant for decades. After a burn at Blackwater Ecological Preserve in Isle of Wight County, the pale grass pink orchid emerged. It hadn’t been seen in Virginia in 70 years. At the Nature Conservancy’s Piney Grove Preserve in Sussex County, the red-cockaded woodpecker is rebounding. The population dropped to just 12 birds statewide, now there’s more than 70. Wilson: There's a John Muir quote that I love that is “Between every two pine trees is a door to a new world” and I think that every time I come out here and I walk between two of these trees. There could be a rare plant lurking on the other side that we haven't seen yet, there could be in a nest of a ground nesting bird that hasn't had a chance to live in this type of habitat in a long time. So I love the idea of having a new world and it being an old world, this is what was here before, so it's new and it's an heirloom at the same time. The longleaf restoration efforts are a partnership between state offices like DCR, Forestry and Game and Inland Fisheries and the federal Fish & Wildlife and Forest Services. The Nature Conservancy is another major partner. Brian van Eerden, Southern Rivers Program Director says the tree is a key player in maintaining biological diversity. Brian van Eerden: In North America, when you're looking at the richest forest systems that we have, longleaf pine is at the very top. Nine-hundred plant species are found in the longleaf pine system and nowhere else in the world. When you look at the biological diversity of the longleaf ecosystem, a lot of that diversity is on forest floor. If you look at the forest it looks rather not so rich because you're just looking pretty much at one species. But if you take the time to look at the forest floor, within a square meter you can have over 40 species co-occurring and that level of species packing at a small scale is unmatched in North America and really globally. The “Johnny Appleseed” of longleaf pine is William Apperson, who retired from the Forestry Department in 2012. He initiated efforts to collect seeds from the last stand of native trees in South Quay Sandhills Natural Area Preserve. Forestry is continuing his efforts by expanding a longleaf seed orchard. Director of State Lands Harvey Darden says it’s similar to an apple or orange orchard. Harvey Darden: We're actually taking scion, we’ll go to a mature longleaf tree, one of these wild trees that we're currently collecting from and we’ll cut a bud from that tree and bring it back to the orchard where we have established rootstock of longleaf pine and we’ll graft that bud onto that root stock. So we're duplicating that native Virginia longleaf where we brought that bud from into the seed orchard. A couple years ago, they got their first crop of two cones. There’s a long way to go, but their ultimate goal is about 800 orchard trees which would bear enough cones to produce 500,000 seedlings annually. Darden: We’re putting more acres into longleaf pine each year. Slowly but surely, we won’t get back to that million acres, probably never, and what we get back to will be a small fraction of that but we’ll be able to say we’ve successfully reestablished native Virginia longleaf pine in the Commonwealth. Wilson: I’m a native Virginian, I’m a thirteenth generation Virginian and the idea of what was here before resonates very strongly with me and I really like being a part of putting some of that back and I love the fact that this will go on long after I'm here. I feel like people in the Middle Ages must have felt when they working on cathedrals; maybe you don't see the finished product in your lifetime but you know it's going to be beautiful and every step along the way is really rewarding. Since restoration efforts began in Virginia about 15 years ago, more than two million native longleaf pine seedlings have been planted on about 5,000 acres across the state. About 100 acres have also been planted on private land. For Virginia Currents, I’m Catherine Komp, WCVE News. Go to WCVE's Facebook page to watch more videos on the longleaf pine restoration.